All laminate floor brands aren't created equal, so it can be a challenge to determine which brand is right for your home. If you're planning to install laminate flooring, these ratings and recommendations can help. When it comes to rating laminate floors, durability is one of the most important measures of quality. In addition, the ease of installation, the value for the price, the appearance, and the ability to withstand fading may all factor into your decision. The following brands stand out in multiple areas, making them a good choice for your home. The planks are thicker than many competitors, often 10 millimeters to 12 millimeters. This means that the laminate is more durable and less prone to flexing when it is walked on. The low price makes this product a good value. This type of flooring features a pre-glued three millimeter underlayment that eliminates the need for a separate layer during installation. Consumers feel this product is easy to install themselves, and it's easier to cut than other brands. Some products by Dream Home may fade in bright sunlight. Patterns repeat on the boards, so it's essential that you mix them up during installation. The product scratches easily if you have pets. Armstrong products are less likely to fade in direct sunlight than other brands. The flooring is very easy to install, even if home owners have no previous flooring experience. It has a beautiful texture and is attractive in the room. Armstrong laminate is resistant to scratches and stains. Dark colors can require constant cleaning to keep them looking nice, since dirt shows up easily. Dropping heavy objects can easily dent this floor. The floor can be noisy and make crackling sounds when you walk on it. The flooring is attractive and has a high-end look. It's very durable and resists scratches. Hampton Bay laminate is inexpensive and represents a good value. It can be difficult to find trim that matches this flooring brand. With a thickness of eight millimeters, Hampton Bay flooring may not be as resistant to dents. It's very easy to install, using the Uniclic system. It's more durable than many other brands and has a long life span. Quick Step is attractive, and it's sometimes mistaken for real wood. Quick Step products are made in the USA. It is very sensitive to moisture and changes in humidity. Quick Step laminate is difficult to keep clean. Since this is a thinner laminate, it may be less resistant to denting. Pergo is very simple to install yourself. This floor is durable and dent-resistant. 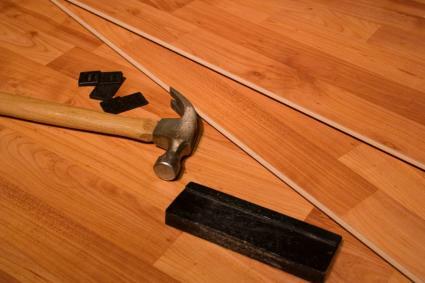 It's easy to damage the Pergo planks when installing them, and this can make the floor very noisy. Pergo can get worn in high traffic areas. The value for the price may not be as high as for other brands. Although ratings and reviews can help you learn more about a product, it's important to remember that not all these factors will matter in your home. For instance, if you live alone, have no pets, and never wear your shoes in the house, the durability of the floor may be less important for you. How much traffic does the room get? This will affect the AC rating you choose. What is your budget? Some laminates are as inexpensive as $1.00 per square foot, while others can cost much more. Will you be installing it yourself? If so, pay attention to what reviewers say about the products installation. How will you be using it? If you have pets or kids, you may need a more durable product. How often will you be cleaning the floor? According to the World Floor Covering Association, many laminate products require special care, such as regular sweeping and mopping, to keep them from getting scratched. Laminate can give your home a high-end look for a fraction of the price of hardwood flooring. As long as you do your homework about the laminate flooring you're considering and think about how the product might fit into your home, you'll be satisfied with your purchase.